The declaration approved at the end of the Nov. 7-10 Fourth National Conference on Food and Nutrition Security, held in Salvador, the capital of the northeastern state of Bahia, states that ethnic and traditional communities must be given access to land to farm through the government’s agrarian reform programme, and to the natural resources on their territories. The meeting, which drew 2,000 delegates, including some 400 guests from other nations, discussed Brazil’s successes and pending challenges in the field of food security. The conference’s conclusions are directed towards different audiences, according to Renato Maluf, president of the National Council for Food and Nutrition Security (CONSEA), made up of representatives of government and civil society. The targets of the message include “those involved in social mobilisations, the government at all three levels – federal, provincial and municipal – and even those who know nothing at all about the right to food…We are also addressing the world at large,” Maluf said at the closing of the conference. It also calls for a strengthening of the agencies involved in that struggle, like the United Nations and the Committee on World Food Security (CFS). Brazil’s Ministry of Social Development and Fight Against Hunger, which presented the declaration in conjunction with CONSEA, said through spokespersons that the behaviour of corporations, monoculture farming with the intensive use of pesticides and fertilisers, and the use of transgenic crops “have obvious effects” in terms of the loss of food sovereignty and contribute to obesity and other chronic health problems. “It is indispensable to come up with policies that gradually reduce the use of agro-toxins and immediately eliminate the use of the ones that have already been banned in other countries, which pose a serious threat to human health and the environment,” the Ministry added. Brazil is considered the world leader in pesticide use: Brazilians consume an average of 5.2 litres of agrochemicals each per year, according to reports presented at this week’s conference. The declaration also highlights the strategic role of family agriculture in achieving food security, along with the sustainable use of natural resources. In addition, it identifies food security and sovereignty as a cornerstone of socioeconomic development. According to official statistics, family farms account for 75 percent of the labour power in the Brazilian countryside, and produce 70 percent of the beans, 87 percent of the cassava and 58 percent of the milk consumed in Brazil. In practice, it is family farming that guarantees food security in this country of 192 million people. During the Conference, which had the backing of the Food and Agriculture Organisation (FAO), a Centre of Excellence Against Hunger was launched with the support of the World Food Programme (WFP) to share this country’s positive experiences in the fight against hunger with other developing nations. One of Brazil’s central achievements is the Zero Hunger programme, implemented by the government of former president Luiz Inácio Lula da Silva (2003-2011) and continued by his successor, President Dilma Rousseff, who both belong to the leftwing Workers Party. The programme, which forms part of the country’s broad anti-poverty efforts, has combined emergency assistance with job creation and family income support policies, and has led to a 61 percent reduction in child malnutrition. Another key initiative, the school meals programme, feeds 47 million children a day while fomenting family agriculture, as by law 30 percent of the food served in the meals must be bought from local family farmers. “Countries have a right to food and development, and if we have discovered a formula that has worked in Brazil, why can’t it work in other countries that are in a similar situation…adapted to their reality,” the Foreign Ministry’s coordinator of international action against hunger, Milton Rondó Filho, told IPS. “We’re talking about a virtuous circle of local development, which we hope can be replicated in other countries,” he said. A success that FAO director-general elect José Graziano da Silva attributed, in an interview with IPS, to the “decisive” participation of the state. “If President Lula had not had the political will to get the entire public apparatus involved in its implementation, we would still be in the phase of doing charity, in the fight against hunger,” said Graziano, a former minister of food security and the fight against hunger in Brazil under Lula. But Graziano also stressed the popular support for the programme and the participation of the private sector – such as the country’s supermarket chains – which he said played a “vital” role in the success of the efforts against hunger. That participation was highlighted during this week’s conference in Salvador. The final declaration was approved in a plenary session by all of the 1,626 Brazilian delegates at the conference, who had been elected in more than 3,000 municipalities by a total of 75,000 voters. Like Graziano, Maluf says this cooperation and involvement has been crucial to the strong performance of programmes like Zero Hunger. “All of us are in favour of strengthening the role of the state, but we understand that poverty cannot be defeated without the participation of everyone,” Maluf told IPS. This participation is as varied as the ethnic and socioeconomic diversity represented at the conference. 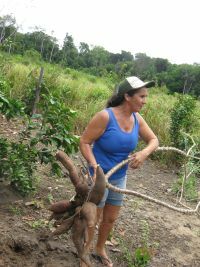 Many of the traditional communities that elected and sent delegates have specific names, such as “quilombos” (black communities originally established by runaway African slaves); “babassu coconut quebradeiras” or breakers (women who gather and break the fruit of the babassu palm tree); ribeirinhos (riverbank-dwellers); “fathers and mothers of candomblé” (the priests of candomblé, an African-Brazilian religion), and small-scale fishers. A doctor who was a delegate from Pernambuco in the Northeast asked to address the conference to request that the speciality of nutritionist be incorporated in the public health system, while a peasant farmer from the central state of Tocantins demanded enforcement in his state of the law stipulating that one-third of government food purchases be from family farms. Another delegate called for the modernisation of the tanks being built in the rainwater collection programme in the semi-arid Northeast. “Brazilian society is still highly authoritarian and conservative, with a very stingy elite that has a history of social inequality – one of the worst levels of inequality in the world,” said Maluf. “What these programmes have done, besides their specific positive impact, was to revive the debate on social policy in Brazil, which was dormant,” he added. Despite the strides made, there are still pending challenges in the fight against hunger in South America’s giant. Although some 48.7 million Brazilians have been pulled out of poverty since 2003 according to a study by the Getulio Vargas Foundation, around 16 million still live on less than 41 dollars a month. These people, the poorest of the poor, are the targets of the Brazil Without Misery programme launched by Rousseff, which aims to eradicate extreme poverty by 2014.